The Back to Nature Network is very pleased to share the online launch details of The Nature Playbook, an important action guide with best practices from our Network which will invite all Canadians to discover their unique way of connecting with nature, and help others do the same! 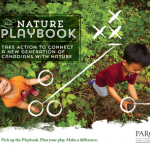 (10/24/2016) A Canadian and globally recognized best practice guide to inspire action and a new generation of thinkers to connect with nature, The Nature Playbook: Take Action to Connect a New Generation of Canadians with Nature, is now available online. The Nature Playbook is a project that was initiated in April 2015 by the Canadian Parks Council (CPC). The book was written and prepared in English and French by an intergenerational citizen-based working group from across the country, supported by the CPC to develop a relatable, action-oriented follow-up to Connecting Canadians with Nature (published in 2014). Time spent outdoors provides irreplaceable benefits in our lives and the more people who experience, connect with, and share their love for nature, the more support there will be for its conservation. Just as the plays in a coach’s playbook spark movement and bring the team together, The Nature Playbook is designed to inspire action – bringing Canadians into the Nature game. The Nature Playbook is grounded in research and provides seven strategies with supporting ‘plays’ for individuals and families to connect with each other and the land. The Nature Playbook embraces Nature everywhere – in our vibrant urban centres and in Canada’s remote wilderness – and that everyone is welcome to experience it. The Nature Playbook made its first public appearance at the International Union for the Conservation of Nature (IUCN) World Conservation Congress in Honolulu, Hawaii on September 2-3, 2016 where it was showcased to international audiences. The IUCN’s #NatureForAll movement adopted, and is now promoting The Nature Playbook as a Canadian and global best practice to inspire a new generation of thinkers and doers across all sectors of society to connect with nature and take action to support its conservation. To download the guide and supporting materials, visit the Canadian Parks Council website here. This entry was posted in and tagged #NatureForAll, #natureplaybook, actions, Canadian Parks Council, connection, nature plays, youth. Bookmark the permalink.